The hangover does not discriminate. It is true that every one of us has individual limits. Should those limits be crossed with a few too many drinks you've secured yourself a one-way ticket to Feeling-like-garbage-ville. The symptoms of overindulgence in spirits were first recorded more than 3000 years ago, with the acknowledgement that there was no known cure. Despite the reality that there isn't a surefire rebound and very likely never will be, it hasn't stopped people throughout the centuries from overconsumption. Creative day after therapies include pickled everything for breakfast, burying yourself in cold sand, consuming more of what made you ill(!) and even a little voodoo. But as we’ve all likely experienced, it seems the only guaranteed way of getting better is to wait it out with lots of rest, some nutritious food to settle the gut, and rehydration. In the short term, it is possible to delay the full brunt of a hangover by drinking a bit of the "hair of the dog that bit you." And sure, you'll feel slightly better for a brief moment, but we don't condone this "remedy". At some point you'll have to pay the price. It was this very thinking though that led one of the cocktail greats, Harry Craddock, to develop a series of drinks potent enough to wake the dead...or nearly dead. These so called Corpse Revivers became widely popular, with the Corpse Reviver #2 earning its way into cocktail canon. After trying one, it's obvious why. Each Corpse Reviver cocktail featured a different base spirit, with the #2 based on gin. Comprised of equal parts gin, Cointreau, Lillet, and lemon juice, this cocktail is easy to make correctly with very little technique required. Oh, and there’s a dash of absinthe in case you thought it was too PG. And while this drink was originally developed to cut through the morning fog, we think this sipper is best after a good meal in the early evening. Beware how easily this one goes down; it's perfectly balanced and very delicious, hence the warning with the original Savoy Cocktail book recipe, "Four of these taken in swift succession will unrevive the corpse again." Here's how to make a great Corpse Reviver #2. Add 1 dash of Absinthe to a chilled coupe and swirl to coat inside of the glass. Add gin, Cointreau, Lillet Blanc, and lemon juice to a shaker filled with ice. Shake hard for 20-30 seconds. Strain shaker into absinthe rinsed glass and garnish with a lemon twist. The Gimlet is a peculiar cocktail. Its origins can be traced back to 19th Century British officers who were prescribed a mixture of gin and citrus juice as a way to fight off scurvy while out on the high seas. Similar to the classic daiquiri, the popularity of this cocktail can be credited to swarthy sailors looking for a comforting cocktail after they regained their land legs. But whereas the daiquiri was invented behind a bar, the Gimlet came into existence on ships where fresh citrus was hard to come across. In lieu of fresh lime juice, ships started carrying shelf stable lime cordials–the most common, and still readily available being Rose's Lime Cordial. The taste of this cordial is completely unique, with an almost unnatural green tint, intense citrus flavor, and a syrupy sweetness. When the recipe for the Gimlet made its way behind the bar, it originally called for equal parts Rose's Lime Cordial and gin. Over the decades, and in the hands of some very talented bartenders, popular recipes for the modern Gimlet have tweaked the proportions and ditched lime cordial for fresh lime juice and simple syrup. While the flavor is slightly different from the version served to sailors, we applaud the substitution of fresh ingredients in place of artificial coloring and high-fructose corn syrup. Modern Gimlets are bright, refreshingly easy sippers. Still, there are some purist who believe that without the inclusion of lime cordial, it's not really a Gimlet. Cocktail guru Jeffrey Morgenthaler took on the challenge of reverse engineering a lime cordial recipe using fresh ingredients. While it's nice to have a homemade cordial on hand, we've come up with a recipe you can build without a bunch of prep that gets you pretty darn close to the original. We've also paid homage to the drink's naval origins by using our Big Bottom Navy Strength gin. 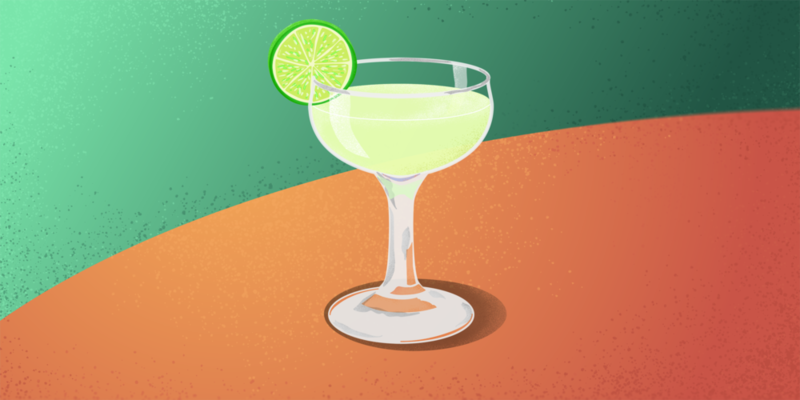 Here's how to make a classic Gimlet. This drink is best served in a chilled coupe glass. Before you get started, place a couple ice cubes in a coupe glass, or place the glass in the freezer for about 10 minutes. To build, add your simple syrup and zest from about half a large lime into a shaker. Then, add lime juice, gin, and a large scoop of ice. Shake hard for 20-25 seconds and double strain into your chilled coupe glass. Garnish with a lime wheel. The addition of the lime zest in this recipe helps give the drink a classic green hue and adds a little extra citrus zing you'd expect from a lime cordial. For the springtime, we've also really enjoy a Cucumber Gimlet variation. For that recipe, after you add your simple syrup and lime zest, drop a couple of large cucumber slices into your shaker and muddle slightly before adding your lime juice, gin, and ice. The cucumber adds a lovely garden freshness to this classic. The Negroni is a classic cocktail that enjoys an almost cult-like status amongst its fiercest loyalists; to the extent that some have exalted this drink with claims that it is the best cocktail in the world! The Negroni even has its own dedicated swag and week of celebration. So it must be something special, right? While we do agree that this seemingly benign concoction of equal parts gin, Italian bitter liqueur, and sweet vermouth is undeniably delicious, slightly bitter, and perfect for sipping on sunny bistro patios, we stop short of claiming that it's the best. The simple fact is that some people really don't like anything bitter in their cocktail. For those who do enjoy the complexity that comes with a bitter liqueur like Campari or Aperol, the Negroni is hard to beat. So what makes it so great? It's balanced, it's refreshing, and it's super easy to build. Equal parts of three different ingredients makes creating a delicious Negroni almost foolproof. As with all simple cocktails, the best thing you can do to set yourself up for success is to start with high quality ingredients. After some rigorous testing and comparison of many different variations, we can confidently say that this recipe makes a damn fine Negroni. Here's how to make a great Negroni. This drink can be built directly in your rocks glass. No fancy preparation needed. To build, place a large ice cube in your rocks glass and add gin, Aperol, and vermouth. Stir with a bar spoon for 15-20 seconds. Squeeze your orange peel over the drink to express the orange oils into your cocktail. You can then toss the orange peel or stick it right into the cocktail. Aperol is a delightful substitute for the more traditional (and slightly more bitter) Campari. Blended with our higher proof Navy Strength Gin, the subtle bitter and grapefruit qualities of Aperol really shine through without being overpowering. The first sip is floral and botanical with a nice spice from the vermouth in the middle before mellowing beautifully to a mild bitter citrus zest on the finish. It's balanced, bold, and incredibly refreshing.